John specializes in personal injury, workers' compensation, and medical malpractice cases. He was admitted to the Maryland Bar in 1973 after graduating from George Washington University Law School. John is a life-long resident of Prince George's County and a graduate of Suitland Senior High School. He is an active member of the Prince George's County Bar Association, Maryland State Bar Association, American Bar Association, and the American Trial Lawyers Association. 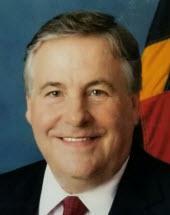 Prior to joining the firm, Mr. Webster was a Commissioner for the State of Maryland Workers' Compensation Commission.